What Are You Seeking in 2015? There is no greater goal, no greater resolution than to seek God more in 2015. The world is obviously a little bit stressed out lately. 2014 saw a whole bunch of chaos. No matter what your political views, there’s no denying the chaos was and is there even on this last day of the year. You may have had a wonderful year, or one filled with struggles. In any event, the new year brings a new opportunity to set some goals and work toward some changes. Now you probably know from the past that most of these changes just do not get done. It’s like decluttering your house. How many times have you vowed to do it, and how many times have you failed? That’s what I thought…me too! 25 “This is why I tell you: Don’t worry about your life, what you will eat or what you will drink; or about your body, what you will wear. Isn’t life more than food and the body more than clothing? 26 Look at the birds of the sky: They don’t sow or reap or gather into barns, yet your heavenly Father feeds them. Aren’t you worth more than they? 27 Can any of you add a single cubit to his height by worrying? 28 And why do you worry about clothes? Learn how the wildflowers of the field grow: they don’t labor or spin thread. 29 Yet I tell you that not even Solomon in all his splendor was adorned like one of these! 30 If that’s how God clothes the grass of the field, which is here today and thrown into the furnace tomorrow, won’t He do much more for you—you of little faith? 32 For the idolaters eagerly seek all these things, and your heavenly Father knows that you need them. Notice how the seeking part, is buried in the worry and the stress? Matthew has it smack dab in the middle of the mess. Why? Because it works. The emphasis though, is on what to seek first. In the middle of 2014 and 2015, lies the chance to do some serious seeking. One day at a time. It may be a little late to recover the time from 2014, but tomorrow is just a few hours away. Start now, seeking Him in prayer as you offer Him your new year. If you don’t know how to seek Him, or what it means to have a true relationship with Him, visit the Knowing God page on this blog. Feel free to research and discuss what it means to seek both His kingdom and His righteousness. If Christmas taught you anything, it’s that all the stuff you may have been seeking either didn’t show up under the tree, or it didn’t make you happy. I write from reality and I can tell you you will always have struggles and chaos in the midst of peaceful days. Happiness is never lasting. The choice though, is to seek Him through every year you have on the earth. There is no other way. Seek Him first. Not Facebook friends, not alcohol, not drugs, not money. Seek Him first. Not status, not the perfect career, not toys and the fastest greatest car. Him. First. Above all. Right now before you land in the middle of a new year. And for the record, can you believe another year has come and gone already? Start now! Comments are off for What Are You Seeking in 2015? Every year I say I am going to …Declutter my house, journal, read more, bake, learn a new craft and organize paper clutter in my office. And every year it does not happen. Well, not most of it anyway. It’s like the view from my kitchen window. We have a backyard that is split in half, with a little gate in between. It is a long, narrow yard, very close to the neighbors. Since we acquired our little rescue dog four years ago, we have had nothing that resembles a lawn. Instead, we have a lot of odd trees and weeds that like to keep coming back every year. Let’s call it yard clutter. This year we finally paid to have the overgrowth removed. We also tackled a downed tree. Everything was pretty, though still not grassy. The yard cleaned up nicely. Both halves were done, but the view from the kitchen window revealed the side that was the cleanest, and the most conquered. Despite the lack of much greenery, it was something to behold. Now however, months later, the weeds are back with a vengeance. Yard clutter. So it is with our yearly, weekly, daily, goals, and plans. The space is cleared. We make room in our homes, our schedules our lives for all sorts of things. Unfortunately, before we know it the whole mess has grown back again. Weeds filling the schedule, our thoughts, our plans, blocking out our attempts to dream some big dreams. Some weeds show up because of our own bad behavior! 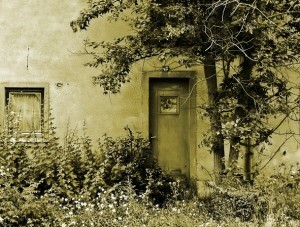 Botttom line, our attempts to simplify, declutter, get rid of the weeds, are thwarted every time. Now you might think this is a bad thing, but it really is no surprise to God. He knows we have no good thing in us, and He knows our sin will come back. Smooth sailing doesn’t last long in a fallen world. The weeds will come back. And with it, things like anxiety, stress, depression, pride, stubbornness, clutter. Notice these are not all blatantly sinful things. Sometimes, they are just time robbers. Sometimes they simply drain you and zap your energy. They grow in like those weeds, quickly, subtlely, unnoticed. Just like in my backyard. 23 But there is another power within me that is at war with my mind. This power makes me a slave to the sin that is still within me. 24 Oh, what a miserable person I am! Who will free me from this life that is dominated by sin and death? Maybe, it’s time to remember the weeds and clutter are simply going to be there. Instead of being surprised by them, clear them up and move on. And if they grow back, tear them down again. If it takes some repentance and confession, so be it. Ultimately, Paul’s answer, Jesus, will be the one who fights through the clutter. 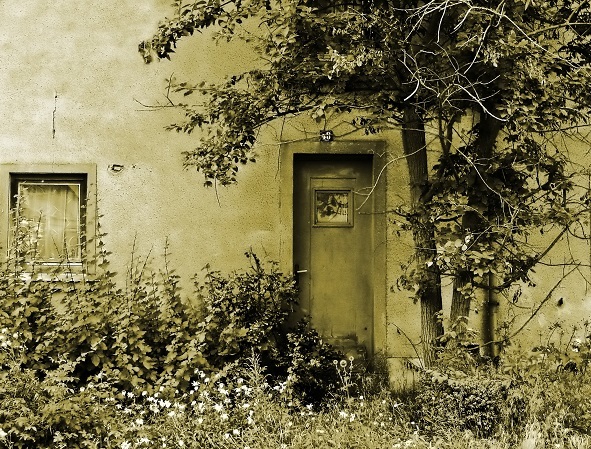 Let God’s presence fill up the overgrown messy weedy places. You may find opposition coming back, and taking over. Opposition to your plans and choices comes in all sorts of forms. Though it is a battle you may deal with every single day for the rest of your life, in the end He has conquered it all. And finally, things will be clear for good. For now, try planting His Word in the barren yard. Next time you take in the view from the window; don’t be surprised by what is growing in the yard. Recognize it, expect it, and conquer it. Tear it down. Deal with it when it grows and back better yet, let Him be the gardener. Simplify your life, by anticipating the opposition. Be prepared for it, and keep moving forward. One of my favorite authors has just released a new book. 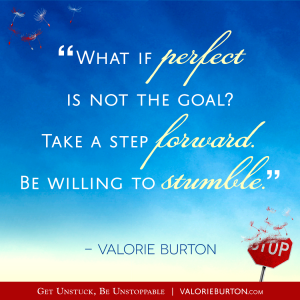 Valorie Burton inspires with her latest work, Get Unstuck, Be Unstoppable. Pay a visit to the book site for further information. Valorie always inspires me. If you want to pursue simple living, based on faith, she provides you with the tools and ideas needed to get there. It’s all about focusing in on your goals and passions, and then following through with them. Moving forward is easier because she wants you to succeed. I would not be working on this blog without the inspiration I gained in her Monthly Momentum coaching program, another resource she offers. The following comes from the author, and gives you a glimpse into the new work. I’ve just purchased my copy and will be reading right along with some of you. 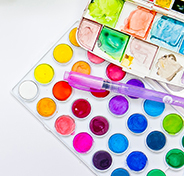 One of the most common misunderstandings that keeps us stuck is the belief that we need to feel inspired to get started. So we wait for inspiration. We wait to feel like moving forward before we move forward. Days, weeks, even months can pass without that feeling showing up, so we stay right where we are. Paired with that idea is often a simultaneous, erroneous belief that the people out there forging ahead– unstoppable in their progress –are somehow more inspired. Well, that is partly right. They are more inspired. But not for the reason we insist on believing. Those who are more inspired didn’t get that way because inspiration finds its way to them more often. They are more inspired because they don’t wait for inspiration to move them. They understand that if they start moving, the inspiration will come. So they get moving. They start uninspired. They see the work that needs to be done and realize it must be tackled. They must dive in. They don’t always feel like diving in. They, too, are bombarded by more instant –gratification distractions. However, they have disciplined themselves to not be lured by those distractions – at least not for long. This single piece of wisdom is worth taping to your desk or using as the background on your laptop or posting somewhere you can be reminded: Start moving and the inspiration will come. Declaration – I choose to move toward that to which God is calling me. I don’t have to have all the answers up front. I just have to have the faith and self-control to get started. Today, God, help me take a step forward. Right now. Not an hour from now. Not tomorrow. When I start moving forward in faith, inspiration comes. Thank You for what is about to happen as I take a step forward in faith! Amen. Comments are off for Are You Stuck?